Summary of today’s show: As Pope Benedict addresses each group of US bishops making their way to Rome this year in their ad limina visits, he is really sending a message to all Americans with his pastoral eye on what we need most. Scot Landry and Fr. Mark O’Connell take up one of the most recent addresses in which the Holy Father discusses the importance of marriage and family to society, the causes for its weakening today, and the prescription for its renewal among the generation of the young today. 1st segment: Scot welcomed Fr. Mark back to the show. He said this has been a weather week for the ages. Fr. Mark said he has spring fever. Scot said he was outside at midday today at the Stand Up for Religious Freedom Rally at the State House in Boston today. It was put together in less than 48 hours and about 400 people showed. There were many good speakers. Scot spoke and reflected on Pope John Paul II’s first visit to Boston and how he spoke about religious freedom and the need for us in the West to defend that religious freedom and now we’re fighting for our own religious freedom here. Pope John Paul II could be our patron saint for religious freedom. Fr. Mark has been planning a meeting of the Catholic Lawyers Guild tomorrow. They’re having a Day of Recollection, an annual event during Lent. It will have the theme of the Book of Genesis. All Catholic lawyers and judges are welcome to come to the Pastoral Center, 66 Brooks Drive, Braintree, tomorrow morning. 2nd segment: SCot and Fr. Mark said they will be discussing an address by Pope Benedict to the US bishops who were visiting Rome as part of their ad limina visits. In our previous meetings I acknowledged our concern about threats to freedom of conscience, religion and worship which need to be addressed urgently, so that all men and women of faith, and the institutions they inspire, can act in accordance with their deepest moral convictions. In this talk I would like to discuss another serious issue which you raised with me during my Pastoral Visit to America, namely, the contemporary crisis of marriage and the family, and, more generally, of the Christian vision of human sexuality. It is in fact increasingly evident that a weakened appreciation of the indissolubility of the marriage covenant, andthe widespread rejection of a responsible, mature sexual ethic grounded in the practice of chastity, have led to grave societal problems bearing an immense human and economic cost. Scot said of all the issues the Pope could talk about, he chooses this topic because the breakdown of the marriage covenant affects all of society. The rejection of the sexual ethic has led to immense societal problems. The fact that so many kids are being raised without both mom and dad has huge consequences for society. Fr. Mark said these ad limina addresses are not just for the bishops in the meeting but for all Americans and these are his first ad limina addresses to the US. SO this is what he’s holding up as the fundamental issue and the fundamental building block. He’s calling us to be fully invested in this defense of marriage and family. Fr. Mark said the answer to the question of how to build the kingdom of God on earth is found in Familiaris Consortio and Sacramentum Caritatis and it is family. The family is the salvation of society. Scot said it’s not just doing things for kids, but the formation of the kids. It’s the parents’ responsibility, not schools or other societal issues. Sometimes parents have to heroically raise their kids as single parents, but the holy Father is saying we have to provide support for families stay together, not pull it apart. Society must help strengthen the family. Fr. Mark said the family is the natural institution created by God. The Holy Father calls for a reasoned defense, not just a faith-based defense, of marriage. Fr. Mark noted that he’s not talking about the Catholic definition of marriage, but marriage itself. Marriage predates Christ’s raising it to the dignity of a sacrament. the Holy Father lists four basic things about the natural institution of marriage. The first is unity, meaning that marriage is exclusive between one man and one woman. The second is indissolubility, until death do we part. The third is procreation and education of children. Procreation is essential to marriage and education is formation. The fourth is the good of the spouses. The good of the spouse is not love per se, but for the other person’s good and vice versa. It’s selfless and other-directed, not selfish and me-directed. Fr. Mark said love is not an essential element of marriage. Arranged marriages are still marriages. Hopefully, they grow to include love. In response to the bishops saying that it’s difficult to communicate the Church’s teaching now and we aren’t getting the job done in making young people understand marriage. One of the reasons it’s not being received by young people is they aren’t coming to church for the sacrament. Fr. Mark confirms here are far fewer marriages in the archdiocese over the past 10 years. While that’s bad, it also means that people who are coming to the Church really do mean it. Fr. Mark said we have to teach about the sacrament of marriage in many ways. Children should be hearing them from families, religious education, homilies, and the like. Pre-cana programs are more proximate preparation. In these programs the priest takes the couple from where they are and launches them on a higher road. The actual marriage ceremony itself must be an act imbued with God. After the marriage we also need to provide better assistance after the wedding ceremony, sometimes called enrichment programs. Scot said one of the reasons we don’t see this very often is there is often a dearth of well-formed couples who’ve been married for a long to help newly marred couples through the struggles and challenges they will face. Fr. Mark said people shouldn’t wait to be asked to help in their parish. Pastors need people to come forward and volunteer to assist. God will use your strengths and weakness in his service. Your weaknesses will often make what you do more accessible. Never feel your not good enough or holy enough. One, he wants to make sure marriage prep programs are up with the times. Scot said the Archdiocese of Boston has renewed its program called Transformed in Love. Fr. Mark was on the steering committee for this program. He said this program fulfills what the Pope is calling for. The bad news is that the program is not being used widely enough. It does have the emphasis on why Catholic marriage? But there are still a lot of poor programs in our archdiocese and other dioceses. Scot said one of the reasons people cohabit is they haven’t heard enough from Catholics around them that it is wrong. We’re not living our faith if we don’t help these couples. Sometimes they wouldn’t cohabit if someone offered assistance, perhaps helping them with money issues that they think they living together for. Fr. Mark said the biggest difference between marriage and cohabitation is that the latter has a big exit sign. It is not a covenant, not until death. Marriage is a full commitment to the other person until death do you part. Scot said there are studies that show that couples who cohabit before marriage are less likely to stay married successfully. Fr. Mark said people think that if they live together they have a better chance, but that’s not proven by the facts. the Holy Father’s central point is the need to recover a sense of charity. Scot said it means using the gift of sexuality in the way that God intended for your state of life: single, married, or ordained. Chastity in marriage is to be faithful to those four elements of marriage that Fr. Mark outlined earlier. Scot said it’s often mistaken for continence, which is refraining from sexual activity. The Holy Father speaks of marriage as fundamental in the way we form and prepare our young to lead our society. Fr. Mark said our voices are drowned out by the counter-arguments in every venue. The Pope is calling us to not be afraid of the truth. We need to be saying this or the truth will be silenced. Scot said the key message is to trust the Church’s teaching. Rejecting all authority makes you miserable. Jesus knew we need to be connected to God and let’s give thanks to the teaching magisterium which guides us in wisdom. Fr. Mark urged married couples to remember the grace of the sacrament which can be called upon in hard times. Marriage is two people gazing together at God who helps and leads. Marriage is not easy. This teaching is not easy, but the rewards are well worth it. Scot said Jesus is trying to prepare his disciples for His death and resurrection. He’s trying to tell them that His death will produce the fruit that we hear at the end of today’s reading from Hebrews: He would become the source of eternal salvation. Fr. Mark said it will come through sacrifice. The first reading has more curses than blessings, but it is a blessing. Jesus prepares everyone for spiritual battle. The battle for religious liberty is a battle. The fight to defend marriage is a battle in service of God. Scot said little did the disciples know that Jesus was going to be glorified by becoming sin. He would take on all the sins ever committed and all those still to be committed. One of Scot’s favorite verses is “I will be their God, and they shall be my people.” It’s very personal. That’s the love that God has for us. Fr. Mark said the covenant is key. Jeremiah speaks of the Mosaic covenant and Christ sealed the covenant for us so that we are forever redeemed. Scot said Jesus uses dramatic language: speaking of “hating” life. Our lives are a blessing from God. What Jesus is saying is that we need to love the promises that Jesus made for us in the next life over what we have now. Fr. Mark said lifers walking with God. That’s what real life is. 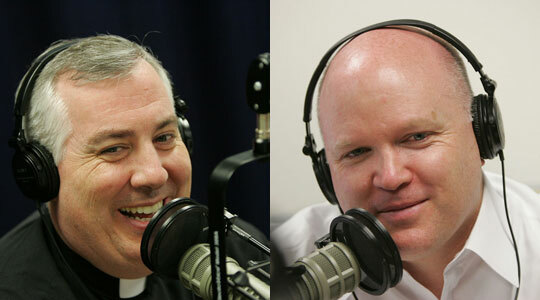 Scout encouraged listeners to renew our Lenten promises and renew our efforts in our fasting.